Est. 1947 as Wilmington College. Moved here in 1961. A campus of The University of North Carolina since 1969. 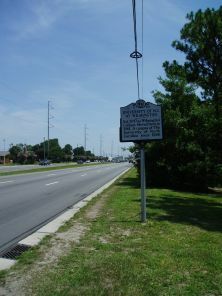 In May 1947, New Hanover County approved establishment of a junior college around Bluethenthal Field. Technical courses in aeronautics, electricity, and construction would be taught at the airfield site, while academic classes would be held at New Hanover High School. Wilmington College officially opened on September 4, 1947; the majority of its 238 students were war veterans. In 1948, the college was accredited and began using limited space in the Isaac Bear Building, across the street from the high school. In 1957, the state legislature passed the Community College Act, providing a plan for organization and operation of community colleges in North Carolina. The following year, New Hanover County voted to place Wilmington College under the new act, thereby making the growing institution part of the state system of higher education. Physical expansion was the next priority, and a new campus site was selected on NC 132 (College Road). A groundbreaking ceremony was held there on April 1, 1960, with Gov. Luther Hodges presiding. In July 1963, by an act of the General Assembly, the institution became a senior college, offering for the first time a four-year curriculum and the bachelor’s degree. Six years later, the school was absorbed into the state’s university system. 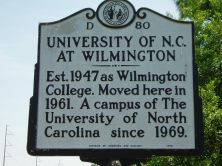 On July 1, 1969, Wilmington College became the University of North Carolina at Wilmington. The old Isaac Bear Elementary School since has been demolished.